Chocolatier by profession, Shock-o-Latier by reputation! 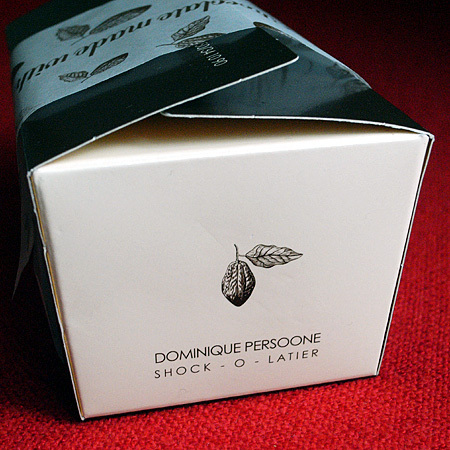 I bought this box the next day at Dominique’s shop “The Chocolate Line” to bring back home. As I mentioned in part 1 of the travel report from Brugge, the highlight (for me at least) of The Flemish Primitives seminar was the surprise box presented to us by Dominique Persoone (owner of The Chocolate Line) and his team which included James Petrie (pastry chef at The Fat Duck), Tony Conigliaro (mixologist, bartender at Roka, blogger) and Bruce Bryan (medical doctor and inventor). As the box was distributed in the auditorium (more than 1000 present, mostly chefs) the instructions were kept very simple: DO NOT OPEN THE BOX! Makes you wonder of course what is inside.